Growing alongside Islamic civilization, the art of calligraphy flourished for centuries. In April, the birth of the Prophet Muhammad (pbuh) was celebrated with special programs all around the country. 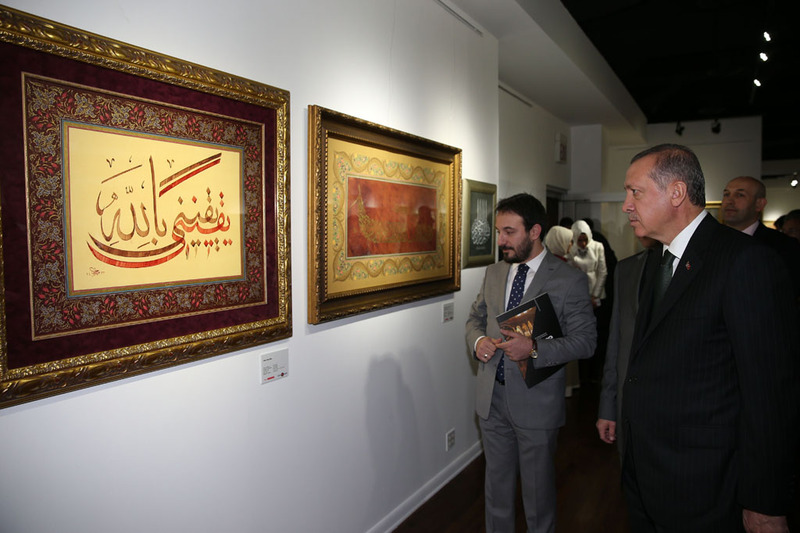 As a part of the celebrations, the calligraphy exhibition "Hicaz'dan Istanbul'a Hz. Peygamber Sevgisi: Aşk-ı Nebi" (Love of the Prophet Muhammad from Hejaz to Istanbul) was held at the Topkapı Palace Treasury Ward and the Haghia Sophia Museum in two successive parts. The event was organized by Turkey's Culture and Tourism Ministry in collaboration with the Islamic Culture and Art Platform. The priceless collection that was displayed at the Haghia Sophia Museum until July will be on display at the Turkish Cultural Center of New York from Sept. 21 to Oct. 22. Prior to its New York debut, the collection will be on display at Tophane-i Amire Culture and Art Center in Istanbul. The impressive work was selected from the calligraphy collections of Albaraka Bank, Bir İmza Arts Organization and the Turkish Foundation of Religious Affairs along with other special collections such as Sufiyane, Meşk and Fennan. It is considered a preview of the world's biggest Islamic art exhibition, Bir Medeniyetin İzinde Saklı Hazine (The Hidden Treasure on the Path of a Civilization), which is a 300-piece collection to be presented by the Islamic Culture and Art Platform next year. Sponsored by Yıldız Holding and the Turkish International Cooperation and Development Agency (TİKA), the event will showcase 41 works of Turkey's master and junior calligraphers along with international names and female artists. The opening ceremony will take place with the participation of President Recep Tayyip Erdoğan, Turkey's ambassador to Washington, Serdar Kılıç and Yıldız Holding CEO Murat Ülker. The art collection features hadiths, verses from the Quran and quotes written in various calligraphy styles such as kufic, muhaqqaq, thuluth, diwani, rayhani, naskh and ta'liq. Among the calligraphers whose works will be on display are Hüseyin Kutlu, Mehmet Özçay, Hasan Çelebi, Ahmed Fares Rızq, Tahsin Kurt, Bijar El-Hac Kerim, Bijar Arbilly, Ömer Faruk Özoğul, B. Hilal Çizmecioğlu, Adem Sakal, Mustafa Parıldar, Mehmet Memiş, Ferhad Kurlu, Ali Toy, Ali Rıza Özcan, Berrak Özdoğan, Mahfuz Zunnun El-Ubeydi, Abdurrahman Depeler, Fuat Başar, Yılmaz Turan, Seyid Ahmet Depeler, Ahmet Sakal, Ziyad Al-Muhandis, Turan Sevgili, Muhammed Yaman, Fatih Özkafa, Muhammed D. Cellül, Fuat Başer, Cavide Pala, Arda Çakmak, Savaş Çevik, Eyüp Kuşçu and Ammar Maliki. The exhibition will be showcased in other countries in 2016. Please type '860' into this field.